Classical Piano Solos for Weddings contains 9 favorite solos in their original form by composers of piano masterworks. Most of these solos are lyrical in style and can be used in wedding ceremonies or at receptions. Each solo has been carefully edited and fingered for performance ease. Essential ornamentation has been realized in the score and suggestions for interpreting grace notes are given in footnotes. 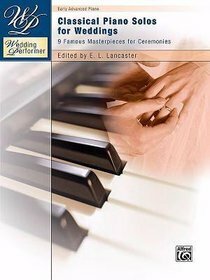 This book is a valuable resource for wedding pianists since the most popular classical piano solos are included in one volume. Both the wedding party and guests will enjoy the beautiful melodies and lush harmonies of these timeless favorites. Titles: Adagio cantabile (2nd movement), from Grand Sonate path?tique, Op. 13 (Beethoven) * Clair de lune, from Suite bergamasque (Debussy) * First Gymnop?die (Satie) * Nocturne in E-flat Major, Op. 9, No. 2 (Chopin) * Nocturne, Op. 54, No. 4 (Grieg) * Prelude in C Major, from The Well-Tempered Clavier, Book 1 (Bach) * Prelude in D-flat Major, Op. 28, No. 15 (Chopin) * Salut d'amour (Liebesgruss), Op. 12 (Elgar) * Tr?umerei, from Scenes of Childhood, Op. 15, No. 7 (Schumann). About "Classical Piano Solos For Weddings (Music Book)"